The survivors are dying…so few are left. They leave behind unquestionable evidence of the horrors committed by Nazi Germany. Unquestionable because there is so much. No other mass slaughter in history was ever so well documented…often by the very people who were committing the genocide. Germans were meticulous in documenting, filming, accounting. When it was all done, survivor after survivor added testimony to the mountain of evidence. And yet, despite the unquestionable nature of the Holocaust, there are so many who question, who deny. One of the most well known victims of the Holocaust is Anne Frank. Why is she so well known? Why does she epitomize so much of what was done during those years? In part, it is because she was a child, the ultimate innocent victim. She died in Bergen Belsen just weeks before the liberation. As she lay dying of Typhus, a Jewish women named Gena Goldfinger (her married name was Gena Turgel), sat beside her. She later told a BBC reporter that she had washed Anne’s face, given her water to drink. It’s a comfort to know that Anne Frank didn’t die alone; that she received, in those last days, some acts of human kindness. Last week Gena Turgel passed away at the age of 95. She dedicated her life to telling others about the horrors she witnessed. She spoke of the short time she knew Anne Frank. And, she spoke about a brother who was shot by the SS, another that went missing, and a sister who was shot while trying to smuggle food into the concentration camp. Despite the plan of Nazi Germany, Gena Turgel was one survivor they could not silence; one survivor who helped others learn. 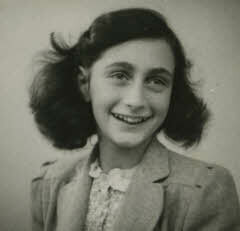 With her death, in some way, we lose not only this brave woman, but perhaps the last connection to Anne Frank.